Almost ten years ago I accepted a position as the course reserve manager for Bierce Library at the University of Akron. In this position I oversaw both the print and electronic reserve services, and early on I was charged by my supervisors to learn as much as I could about copyright to help ensure that the library’s reserve practices fell within the scope of the law. As I began researching the law I was a bit surprised by how much information I found on the application of fair use for reserve services. Unfortunately, it took me a while to realize that much of the information available online on this topic is deficient and propagating many myths and misconceptions regarding fair use. In turn, this flawed information was limiting the ways in which academic libraries provided reserve services to our campus communities. In this post, I’d like to address a few of the fair use misconceptions hear most often regarding reserve services. Misconception #1: Fair use has specific limits. For example, fair use is limited to one chapter from a book, one article from a newspaper or periodical, or a single photo, chart, or graph from a book, periodical, or newspaper. This misconception is tied to the third factor of fair use and, as you’ll see in the statute, there are no such limits found in Section 107. To determine how much of a work can be reused under fair use, it is helpful to know the caselaw of the statute. Examining the U.S. Copyright Office’s Fair Use Index, you’ll find cases in which the reuse of 100% of a work was considered fair use, and other cases in which reusing small portions of works were found not to be fair use. When faculty hold up a book and ask me “How much of this can be scanned and placed on electronic reserve?” I ask them to tell me how much of the work they need to use for course instruction and help them consider how this amount balances with the other three factors. When making a fair use determination it’s important to remember that no one factor on its own determines fair use, rather they all need to be considered in relation to each other. Misconception #2: Fair use can be considered for the first semester of use only. Any subsequent use of a copyrighted work for reserve requires that you pay a license fee for the use. There are no term limits found in the fair use statute. When a faculty member who has placed a work on print or electronic reserve under the auspices of fair use asks me about reusing the work in subsequent semesters, I encourage them to work through the four factors of fair use again to determine if any of the circumstances of their use has changed. If they have, and if their use of the work may no longer fall within the scope of fair use, we consider other options that may be available to them for making the work acessible to students. This could include the utilization of other exceptions found in the law, such as the Technology, Education and Copyright Harmonization Act (TEACH Act) found in Section 110(2) of US copyright law, linking to a copy of the work made freely and legally available online, seeking permission to reuse the work, or obtaining a license to reuse the work. Misconception #3. Fair use can only be used to make “x” number of works available to students through reserve, and after you hit that number you must obtain permission or a license to share other works with students. 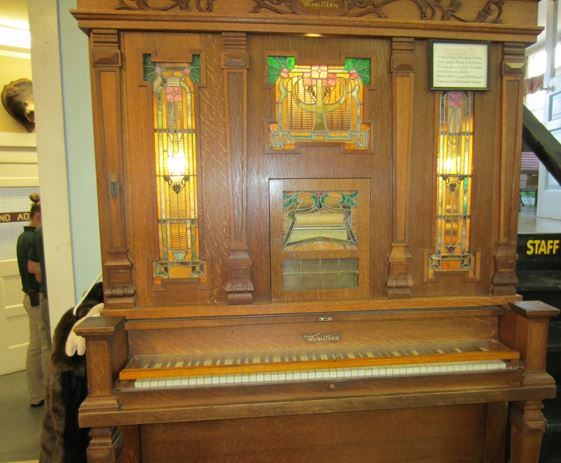 Fair use is sharing up to five photographs. Fair use is sharing up to nine journal articles per class. Fair use is sharing up to two chapters/readings from a particular author. These limits are also not found in the fair use statute. Fair use can be utilized as many times as needed for each individual course, each semester. Just make sure you’re making fair use determinations on a case-by-case basis for each work being placed on reserve. The American Library Association’s Fair Use Evaluator can help you in making these determinations. 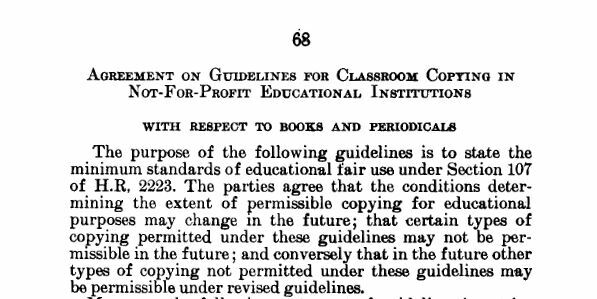 These misconceptions (and many others) arise from the Agreement on Guidelines for Classroom Copying in Not-For-Profit Educational Institutions with Respect to Books and Periodicals (also known as the “Classroom Photocopying Guidelines”) that ware put forward as part of a House Report in 1976. [T]he Guidelines establish numerical caps on how many words a teacher may copy and still stay within the safe harbor. This brightline restriction stands in contrast to the statutory scheme described in § 107, which codified a multi-factorial analysis in which no factor is dispositive. Thus, the Guidelines’ absolute cap, which would preclude a use from falling within the safe harbor solely on the basis of the number of words copied, is not compatible with the language and intent of § 107. We note that the Classroom Guidelines, although part of the legislative history of the Copyright Act, do not carry force of law. In any case, to treat the Classroom Guidelines as indicative of what is allowable [under fair use] would be to create the type of “hard evidentiary presumption” that the Supreme Court has cautioned against…so we must not give undue weight to the amounts of copying set forth in the Classroom Guidelines. The case is still under appeal, and you can learn more about it and follow new developments in this LibGuide hosted on the Georgia State University College of Law Library’s website. I also encourage you to read The Law of Fair Use and the Illusion of Fair-Use Guidelines, authored by Dr. Kenneth D. Crews, an attorney, author, professor, and international copyright consultant, as it will help you better understand how many of the various “fair use guidelines” were developed and the ways in which they misconstrue the law. When talking with faculty and librarians about copyright, I also always encourage them to remember our shared mission and not let fear of being sued prevent them from utilizing the exceptions found in the law when looking to connect students with educational resources or provide new services to them. This does not mean that we should ignore the law in its entirety or assume that because we have an educational purpose we are free to reuse works however we want. Rather, it means should consider what options the law allows and work within the scope of that law to support the educational mission of our institution. There are also options aside from the exceptions found in US copyright law that are available to use when providing course reserve services. This includes linking to works available in the library’s online collections or made legally and freely available online, using Creative Commons and Open Access works within the scope of their license terms, and obtaining permission to reuse works from the rightsholders. If these options do not work, the library can then investigate acquiring a license to make the work available through reserve. 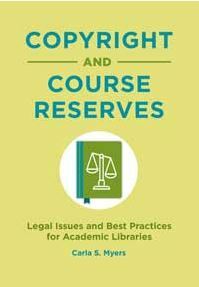 I’m excited to announce that I have a forthcoming book on this very topic, available later this year: Copyright and Course Reserves: Legal Issues and Best Practices for Academic Libraries, published by Libraries Unlimited (978-1-4408-6203-8). In the meantime please feel free to reach out to me with your questions regarding copyright and course reserves or seek additional information in the many excellent sources I’ve cited here. Carla Myers is Assistant Professor and Coordinator of Scholarly Communications for the Miami University Libraries. Her professional presentations and publications focus on fair use, copyright in the classroom, and library copyright issues. She has a B.S. in Psychology from the University of Akron and a Masters in Library and Information Science from Kent State University.